Offering stunning views of the River Irvine and the Low Green, 80 Waterside is a traditional semi detached villa offering flexible spacious accommodation throughout. The property boasts four bedrooms, lounge, dining kitchen, two bathrooms, and benefits further from off street parking to the rear and generous easily maintained gardens. In summary the property extends to an entrance vestibule leading to the spacious and welcoming hallway with stairs to the upper level. The front facing lounge has maintained many of its original features, with traditionally high ceilings, gas fire, stylish cornicing, and feature bay window. To the rear of the property the master bedroom is double in size with gas fire and views to the rear garden. The dining kitchen is well lit, via a velux window, and comes well stocked with floor and wall mounted units, integrated fridge, freezer, gas hob, oven and hood. Access to the rear garden and utility room are off the kitchen. The modern fitted bathroom completes the ground floor with bath, WC and WHB, all finished to neutral tiling. The upper level houses three more bedrooms and a further family bathroom. All three bedrooms, are double in size with bedroom 2 offering views across the River Irvine and the Low Green. The bathroom is a well presented with bath, over shower, WC and WHB. Externally the property comes with gardens to the front and rear, with off street parking. To the front the garden is laid predominantly to lawn with mature shrubs, and perimeter wall. To the rear the gardens are generous in size laid to a combination of patio slabbing, and shrubs. To the rear there is off street parking for 3-4 cars. Waterside is an established and popular residential area. Irvine town is close by and provides access to a range of amenities including supermarkets, bars, restaurants and town centre shopping. There are a number of local primary and secondary schools within the greater Irvine area. 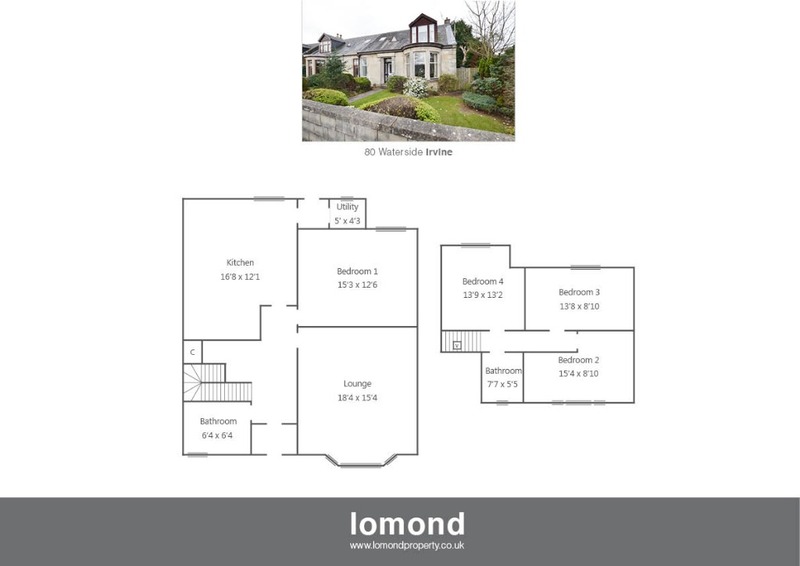 please note this property is owned by a member of Lomond staff.